There you will see faces of (as of this writing) 6,750 U.S. service members who have died in OPERATION IRAQI FREEDOM and OPERATION ENDURING FREEDOM. These are OUR children. ALL OF OUR CHILDREN. Take a minute to reflect on that. God Bless Them, Their Families, and Keep them always in our Hearts and Memories, For the Great Sacrifices Made in The Name of Peace, Liberty, and Freedom. 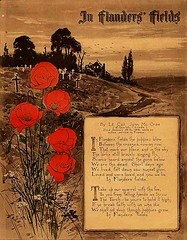 This entry was posted on November 9, 2013 at 8:46 pm and is filed under American Military, bereavement, Cemetery, D-Day, Death, Funeral Service Professional, Ghosts, Grief, Life, Loss, Mourning, Operation Enduring Freedom, Operation Iraqi Freedom, Patriot's Day, Poetry, Soldiers, Thought For Today, Tragic death, Veterans, WAR, WWII with tags Arlington National Cemetery, In Flanders Field, John McCrae, Remembrance Day, United States, We Shall Not Sleep, World War I. You can follow any responses to this entry through the RSS 2.0 feed. You can leave a response, or trackback from your own site.